The Ricoh Theta V (reviewed here) is one of the most convenient 360 cameras to use, with a slim form factor, in-camera stitching for photos, and an in-camera stitching option for videos (although you’ll need to process the video in order to add stabilization). 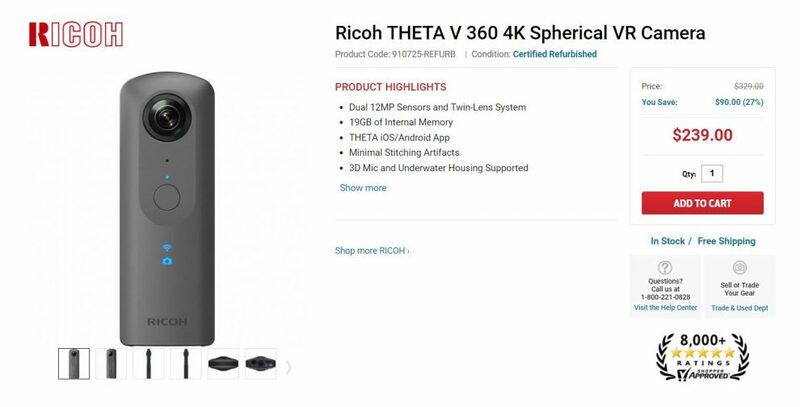 Regularly the Theta V is $375, but you can get a refurbished one for as low as $239 from Focus Camera, or a certified refurbished one from Ricoh for $301. Is this a clearance sale? Is Ricoh about to release a new camera? I think it’s too early to say that, particularly since a new Theta V is still around $375. GoPro Fusion at $399 (no trade-in required): Should you buy Fusion or Insta360 One X (or some other camera)? DEALS: LivePlanet VR camera 50% discount (save $5,000)! Rumor has it you might be right. RT might be dropping something new with a resolution boost real soon. Cleaning out stock. Can’t wait, hopefully this Sparks the competition in the 360 space. There is a rumored 5.7k version in the works, but last time, it took them a very long time to release the 4k version. For that reason, i’m skeptical that they will be releasing it anytime soon.